Counting stubble density in the fall can help growers determine if their spring seeding rate was adequate to reach the crop’s yield potential. Canola generally needs a minimum of 4-5 plants per square foot to reach its yield potential. 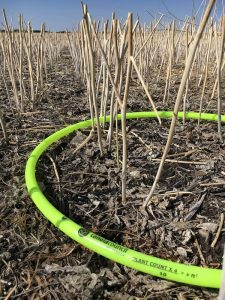 By collecting a few years’ worth of plant stand data and cross referencing it with seeding rates, yield, grade and maturity data for each field, farms can determine their own most economic target stands. Growers may also discover that in some situations (related to seeding date, residue density, etc.) four plants per square foot provide a satisfactory profit while other fields or other years may need a full 10 plants per square foot to satisfy profit and risk management requirements. Consider maturity and quality as well as yield. Growers may be able to achieve target yields over time with a lower plant density, but thinner stands do produce branchier plants that take longer to mature. This can increase the risk that fall frost will lock in high green counts. HOW do I count them properly? Method 1. Count the stems per metre of row. Take that number and multiply by 100 then divide by the seed row spacing in cm to get plants per square metre. For example, 25 plants per metre of row multiplied by 100 then divided by 25 cm (10” row spacing) is 100 plants per square metre. Divide by 10 to get plants per square foot. Method 2. Use a hoop with an inside diameter of 56 cm. This is equivalent to 0.25 of a square metre. Count the stems inside the hoop, and multiply by 4 to get plants per square metre. Then divide by 10 if you want plants per square foot. Repeat counts a few times throughout the field. Harvest versus early-season counts. Plant counts often drop 10-15% through the season. If more severe than that, check scouting notes and consider the most likely reasons – Insects? Weather? Disease? – and whether there’s a profit-improving way to prevent this. Seed choice may be part of the solution. If counts increase, which is also possible, take a close look at all plants in the harvest count to see how many are actually contributing to yield. Small spindly plants that emerged well after all the others may not have that many pods, and should not be included in the count. Use the calculators at canolacalculator.ca to help with target stand and seeding rate decisions and watch the stand establishment video (below), which has tips for plant counts.